Globe iPhone 5 Pretty Much Confirmed?! #GlobeiPhone5, Coming Soon?! Globe Telecom hasn't really given official word to the media on the availability of the much-anticipated Apple iPhone 5 via its postpaid plans and prepaid kits. 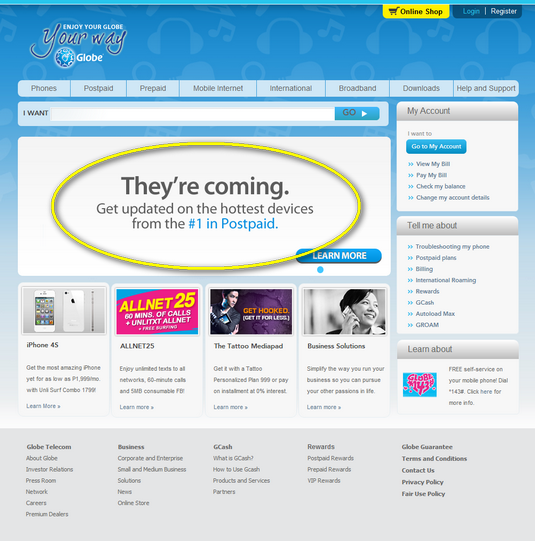 But if this sign-up form - currently live on Globe's consumer website - in any way indicates what's ahead for the company, then it appears iPhone 5 will definitely be part of its handset line-up soon! On the upper portion, the form has the line 'They're coming', which I believe is a play on the usual cryptic text that Apple uses on its product announcement event invites. And on the right side, there are links to Globe's blog posts about Apple's flagship smartphone. 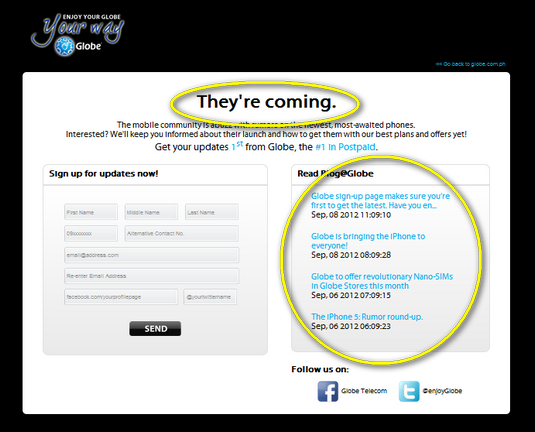 If you ask me, I think these pretty much confirm that #GlobeiPhone5 is really arriving soon -- unless, of course, Globe is just trippin' with this form. TP Friends, note that this sign-up sheet is just for updates and not for pre-ordering the iPhone 5 from Globe. Last year, #GlobeiPhone4S pre-order form went live around December and the company officially launched the handset on December 16, 2011, which was - incidentally - also the same day Smart Communications launched #SmartiPhone4S, if you remember.